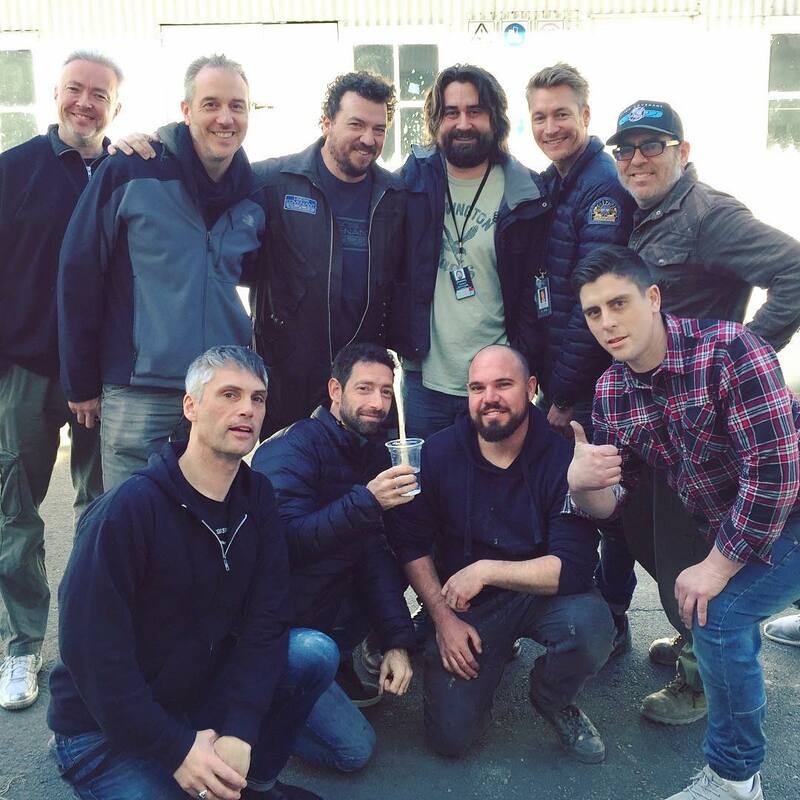 After nearly three months of shooting, Sir Ridley Scott’s Alien: Covenant has officially wrapped! Last Saturday the crew celebrated with their wrap party and have started to move on to other ventures. You can find pictures from the wrap party and the crew showing of their Covenant clothing in our forums. Some of the art crew are remaining on the film to help with design work in post-production. Now it’s up to effect companies such as Animal Logic and MPC to provide the special effects for Alien: Covenant. 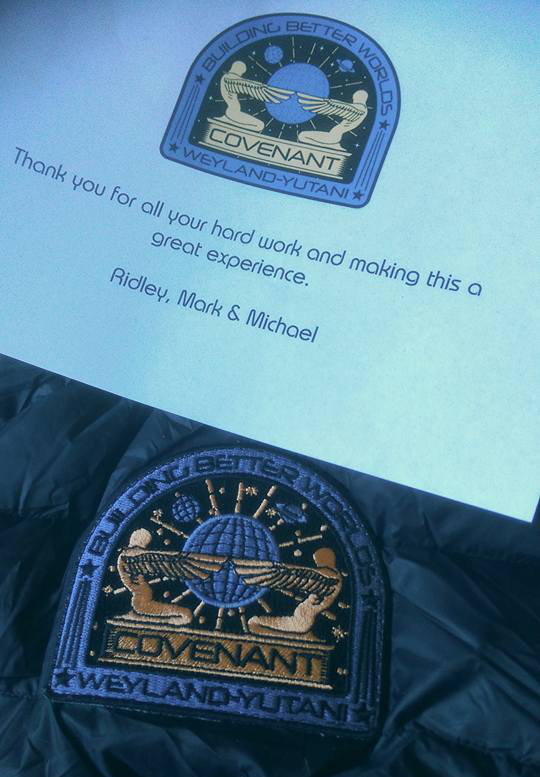 A “Thank You Note” from Ridley Scott, Mark Huffam and Michael Schaefer to the crew along with a Covenant patch and jacket (better seen here). They made it through filming with very few leaks. Alien vs. Predator Galaxy were the first to reveal any sight of the film to the world with the location pictures from Milford Sound and the Daily Mail showed off some interesting pictures from the quarry location outside of Sydney. Danny McBride poses with the Odd Studios (creature effects) crew. They’re all sporting various Alien: Covenant clothing including a cap that includes a Xenomorph! Higher-resolution copy here. With just over a year left before release, we now wait while post-production work begins on Alien: Covenant and the marketing campaign starts to kick in. Stick with Alien vs. Predator Galaxy for the latest! Off-topic, but how long did it take to film the quadrilogy Alien films? Woot Woot !!!! You're the best Ridley ! I don't know off-hand but Wikipedia has Alien as taking about 3 and a half months, Aliens 10 months, Alien Resurrection 5, Prometheus about 3. No Alien 3 details. Ok, I was just wondering since I've never thought about it before, and was wondering is three months a short time or not. When do you think we will see a trailer or some footage? How long before the release of the film was the first Prometheus trailer? Seven months or so? The first footage of Prometheus was shown at SDCC about a year before the film's release. I know Fox aren't going to be there to show off their films for fear of leaking but I suspect/hope that they may actually release something online during SDCC this year (next weekend). Thanks Hicks, yeah that would be cool if they did. I think they were still filming at the time they showed Prometheus off. In Iceland, if memory serves. Sounds like Covenant will be having a longer post period. Yeah, I really like that quote too. I really can't wait to see something of the Giger-style sets! Yeah the whole "exact sets" quote was very good to read! Hopefully it will flow/edit very well and will be on schedule for it's target release date. As for the Alien3 filming time, I imagine it felt like it took forever. How is it we don't have any leaked shots of the xenos? I'm dying to see what they look like. Off the top of my head: Alien shot from July '78 and wrapped in winter, err, October? But model shooting went on for months afterwards. I don't think Aliens took 10 months to shoot at all. 3 months is the norm, for a typical two hour picture. I don't think we had any leaked footage of Prometheus' creatures. Well, unless you count the trailer we got our hands on early but that was a trailer. I wouldn't expect to see any until the official marketing start. If any. I feel like they might want to keep the Alien hidden this time around. I don't think Aliens took 10 months to shoot at all. 3 months is the norm, for a typical two hour picture. Yeah, I thought that was odd. But that's why you never trust Wikipedia.